We hear time and time again how people find it difficult to eat Keto on a budget. Of course, in a perfect world we would all eat farm to table and get back to the healthier way of living but now-a-days, that is considered “eating organic”. In all reality, it is the way things should be, but we live in a fast-paced world where people don’t take the time to think twice about where their food comes from. It may not be ideal to stick to all organic keto foods when you are eating on a budget but you can definitely make some healthier choices even when watching the bank account. We try to buy fresh over frozen and frozen over canned if it comes down to choosing vegetables and fruits. The main things to remember when you are shopping the keto way is to limit carb intake to 20-25g, keep protein moderate and add in a high amount of good, healthy fats. We also recommend staying away from “low fat, no fat, fat-free, sugar-free, and artificial sweeteners. When in doubt, flip and check the nutrition label. Eating keto on a budget is totally doable and just takes a bit of extra thought. Once you get the hang of things food wise, you will start adding in more recipes and you might find you actually love the keto way of eating. Preparing for a family of four, I try to think in advance about what we will have for dinner and use all the food we make but switch it up a bit each time we eat it. If we have grilled chicken one night we will have it with veggies, then the next night we may add it to a salad and the third night (if it makes it that far, a chicken veggie soup. Changing up the recipe to a staple really helps break up the monotony of eating the same things all the time. 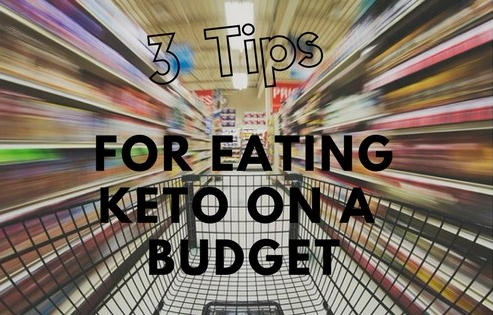 We have learned a few helpful tips for eating keto on a budget and thought it might be helpful to others. Save time and money using the click list at your local grocery store. Places such as, Kroger, Walmart, and King Soopers will deliver your groceries after you place an order online. You can select a convenient pick-up time, avoid impulse buys of junk you don’t need to bring home, and be selective about your keto purchases to get the most bang for your buck. You can also put some thought into planning out your meals for the week. Whether you are in the store shopping or choose to do online grocery shopping you can utilize coupons to help cut some of the expense. Many online grocers allow you to click coupons while you are adding items to your cart if they meet the criteria. Not only does it save me the hassle of trying to find a coupon at checkout, but I can also apply it immediately to the items in my cart and not have to worry about it being expired or misplaced. Money in my pocket! Genius! When you buy in bulk and plan for the week you are less likely to overspend. Buying in bulk also allows you to cook up a bunch of goodness at once and then reheat leftovers the next day or two, which keeps you from grabbing something on the run that won’t help you along on your keto way. You will also spend less and get more for your money when you buy in bulk, rather than spending less on a smaller portion and having to buy it sooner because you ran out. You can compare weight and see what is the best bargain. We especially splurge a little on things we know we eat a lot of, i.e. bacon and save elsewhere on things we might only occasionally eat. Keep in mind we already have some keto staples in our pantry.